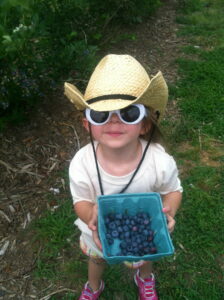 This has to be my favorite time of the summer—berry pickin’ season! It is punkin’s third summer of our trips to Orr’s Farm Market, a 1000 acre orchard and farm that has remained in the Orr Family since the 1930’s. It is one of my favorite family traditions and I smile to think one day as woman she will look at me and muse, “Mom, remember our trips to Orr’s?” She will remember the wagon that takes us to the berry patches (a free treat) and how beautiful it looks in the Shenandoah Valley amongst the orchards. The only sounds are the laughter and giggles as I chase her through the rows. It is….magic. Now that the temperature is climbing, my morning coffee becomes an iced one. Making iced coffee is simple for me: You fill a tumbler 2/3 with ice, put in your cream and sweetener to taste (my preference is french vanilla creamer, no sugar), pour a fresh brewed cup over and voila! Cafe Heaven…. 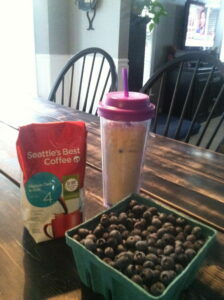 As a special treat this morning I topped my Seattle’s Best Iced Coffee with the blueberries picked from yesterday’s outing. This is a recipe I can enjoy all berry pickin’ season with sweet cherries, raspberries and blackberries….yumm! I’d love to hear about your favorite summer family traditions. Drop me a comment below or post on my twitter or facebook page to be entered in a drawing for a Seattle’s Best tumbler and a bag of coffee! In your comment use the hashtag #HotIced for an extra entry. Winner to be drawn on July 5. Enjoy! Summer time is for sunblock, sprinklers, and pudding pops at our house! Every Friday we make a new flavor and eat them after dinner. Little Monkey goes to bed with chocolate or banana cream smiles! Congratulations Ashley! You have been chosen to receive the giveaway of some goodies from Seattle’s Best Coffee. Enjoy! That little punk in’ sure does look cute in a cowgirl hat.